Pay No Taxes on All Special Order Dresses! Stella's Spring Bridal Sample Sale! All Gowns Up to 90% Off! Designer Wedding Gowns Including: Aire Barcelona, Watters, Willowby, Justin Alexander, Maggie Sottero, Stella York and More! Stella's will be open on Monday, Louis Riel Day, from 1pm to 5pm! There will be in-store specials, so be sure to visit! Stella's Annual Boxing Week Sale! Pay no tax on all purchases! "Find the one" at Stella's Bridal. Maggie Sottero First Look Wedding Dress Event! Stella's Bridal is excited to host a First Look Event from Maggie Sottero, the world's premiere wedding designer! This exclusive event will feature wedding gowns from the 2018 collections of Maggie Sottero, Rebecca Ingram, and Sottero & Midgley. Contact us today to schedule your shopping appointment. Black Friday Sale! Pay No Taxes On All Purchases! Watters Wedding Dress Trunk Show! Book Your Shopping Appointment Today! Looking for the perfect dress for an upcoming wedding or special event? Look no further than Stella's Bridal! We have hundreds of dresses that are priced to clear! Up to 90% Off Original Price! Call today to book your shopping appointment! 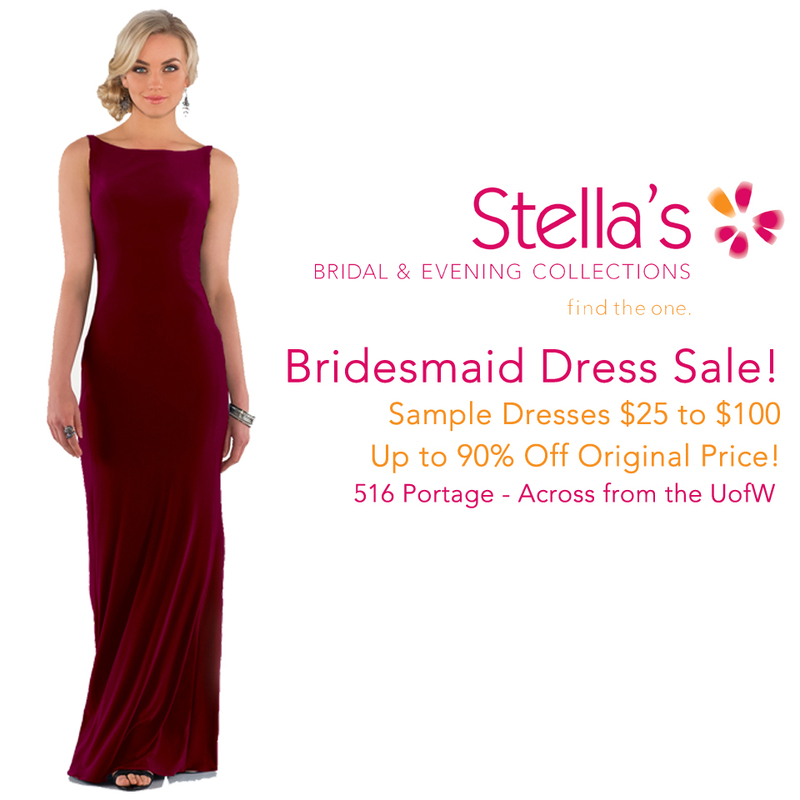 Stella's Annual Bridal Sample Sale! All Gowns Up to 80% Off! Sample wedding dresses are priced at $500, $600 or $700! "Find the one" for less this Saturday, July 15!